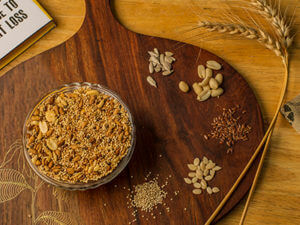 Quinoa & Seed Mix (Jalapeno Seasoning) is a soulful snack having wholesomeness of quinoa, amaranth and various seeds like sunflower, peanuts, flax and melon seeds. Quinoa and amaranth are traditional gluten-free foods which have been celebrated as mother of all grains by old civilizations. Seeds and nuts contain a bundle of good fat and essential nutrients like vitamins and minerals. Seeds contain mono- & polyunsaturated fatty acids, omega-3 and -6 fatty acids, several vitamins like B-group vitamins, vitamin E and crucial minerals like Magnesium & Selenium. Quinoa & Seed Mix can be a perfect replacement for traditional fried snacks. 1. The snacks at Truweight have been formulated to eliminate refined ingredients in traditional Indian snacks and replace them with superfoods. 2. In comparison to other snacks in the market, it is more healthy and unique, as it is a balanced mix of good protein and good fat. 3. Amaranth is one of the most protein-rich of any plant-based food, rivaling that of animal-based foods like cheese, in addition to being rich in calcium and micronutrients such as magnesium. 4. Quinoa has a high protein content, higher than other grains (16.2% – 20% protein, while rice has 7.5%, millet 9.9% and wheat 14%.) The protein quality is unusually superior, making quinoa a complete protein and its essential amino acid balance is similar to milk. 4. Adding sunflower, peanut, flax and melon seeds to your diet benefits your health as the seeds are an excellent source of numerous health-benefiting nutrients, dietary fiber (mucilage), minerals, antioxidants and vitamins that are essential for optimum health. With Good experience and fair knowledge in the field of SEO & Social Media, trying to be a writer. After all, it's all about learning new things and adding feathers to your hat! © 2019 - Truweight. All Rights Reserved.